Telephone us on +44 (0)208-6000-130 [UK & International] or 1-888-908-2858 [US and Canada toll-free]. During office hours [9am to 8:30pm (UK), 4am to 3:30pm (EST), Mon to Fri] we'll be pleased to help you through your first BullionVault trade, one button-press at a time. You can open an account with a few simple details in just 2 minutes. You’ll receive a trial 4 grams of silver and a small amount of cash to let you try out our system. See them on your Balance. Fund your account by making a bank transfer to our Client bank account. 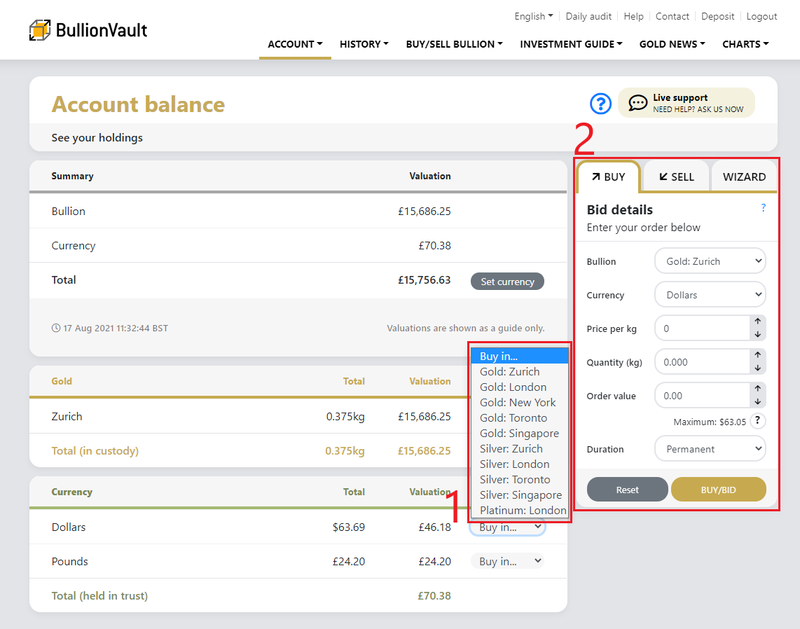 See BullionVault’s bank details. Please be sure to include your BullionVault username as your payment reference to ensure that the funds can be assigned as quickly as possible to your BullionVault account. Once your funds have been applied we will send a confirmation email and you will see them in your account. You can buy bullion as soon as your funds have cleared and visible on your Balance under Currency. You can buy bullion on BullionVault’s markets directly from the Balance page (as well as through the Order Board). Ordinarily you'll get the message “Your order has been fully matched” at the top of your order panel. If so, then congratulations - you have bought your bullion. You will get email confirmations of your deal soon after. Make sure you check them. If the market is particularly volatile, you might see a different message. If the market has risen sharply so that there are no sellers at the price you specified, you may not get the bullion you asked for. This can happen when buying in an open market! Find out more about ways to buy bullion or view our step-by-step guide to the market order board (accessible from the "What is the order board?" link). We assign new accounts a trial 4 grams of silver and a small amount of cash so that new users can try out buying and selling on BullionVault before funding, if they wish. We need you to provide evidence of your identity and bank details by uploading digital photos or scans of relevant documents. There are two reasons for this: one is legal, the other is practical. Legal: BullionVault is obliged by law to establish the identity of its customers. Practical: both BullionVault and you are much safer when we agree at the outset the repayment destination of your funds - for when you eventually sell your bullion and withdraw your money. You don’t have to validate your account before you fund your account and buy your bullion but you should validate it within 2 weeks of funding your account. Follow the price movement of gold, silver and platinum with the price chart. Read the latest articles in Gold News. Sign up for our Weekly Update newsletter and free daily market-news email from the communications preferences section of your settings.